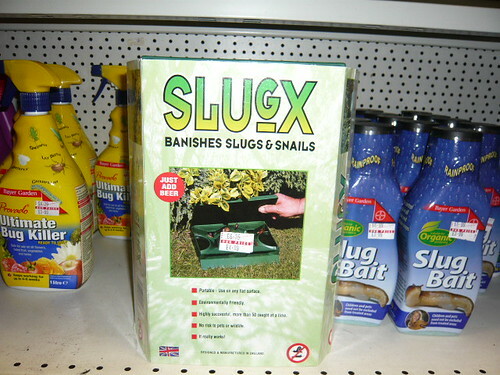 Slug pellets are one of the best selling garden products on the market. The reason is simple, slugs are the biggest and most persistent pest out of all garden pests. Left unchecked, slugs can decimate seedlings and even established plants. Slugs have a fondness for the most delicate and beautiful plants – they rarely eat our weeds! Slug gone wool pellets (wool fibres have tiny barbs on). Using a penknife to cut them in half. Some people advise putting egg shells and sharp gravel around plants. However, this often fails to work and is both time consuming and unsightly. 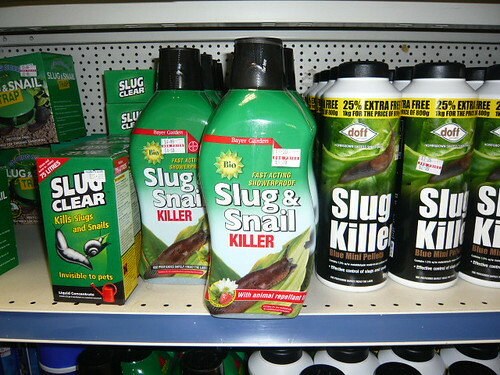 If you don’t fancy the above methods, slug pellets are an effective choice for dealing with a large number of slugs. Some Advice on Using Slug Pellets. Don’t spread them too Thickly. It is better to spread a small number over a large area. Some people pile them up like pebbles on a beech, but, this doesn’t really increase their effectiveness. Push Underground. After broadcasting slug pellets on soil, use a hoe to push some pellets under the soil. Most slugs are active below the soil. Pushing them below surface makes the soil more attractive and also prevents them killing birds like Thrushes. At Glee garden trade show 2011 I saw a slug bell that is designed to disguise the pellets but from who or what? Rodents are active at this time of year. In late summer they think about shelter for winter and start building nests in warm areas like old garden huts or garages. A second problem comes as rodents scavenge for food to see them through winter. Mice love to eat crocus and other newly planted bulbs. I have found rats like the warmth of my compost heap to say nothing of the kitchen food scraps they can find on the heap. Remedy these problems with a chemical product or opt for a humane trap. 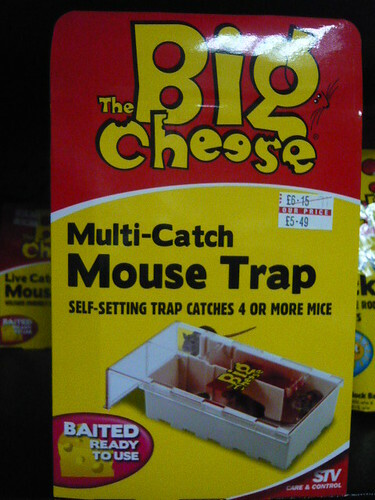 Humane traps leave you with the problem of disposal. It isn’t right or fair to the animal. For example if you catch a grey squirrel it is illegal to let it go again. There is no legal poison for home owners to use on squirrels. So that leaves lethal traps designed to do what it says in the name. After a dry winter and even dryer spring gardeners are keen to see more rain. Unfortunately more rain equals more slugs and snails. One benefit of the dry weather has been a reduction in the amount of plant damage done by Slugs and Snails. So much so that I have been able to leave these critters unmolested by my sundry treatment methods. Seeing these various chemical treatments on the shelf at our garden centre I was able to restrain myself and not make a purchase. The slugs can munch on a bit longer. The only concern I have is for a new collection of young miniature Hostas that I hope will expand and not become an early lunch for molluscs. Amazon selection of Slug and snail products. Some pets like dogs and cats plus other animals can be a pest in the garden. Their crimes are eating the wrong thing, digging in the wrong area, turning grass brown with urine and leaving a mess. The worst offenders are rabbits, cats, mice, deer, pigeons and dogs including foxes. 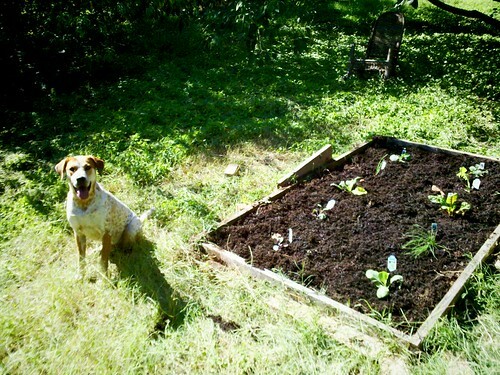 Cats and dogs scrape and dig often in the friable soil where you have planted precious seedlings. They can be frightened off with a sonic sound device like the one above. Scent can scare off many animals. Old wives tales of lion or elephant dung may be far fetched but Retnardine sprayed on seems to work. Rabbits and deer can be fenced out of your garden with special mesh, wire or high fences. That way the pesky blighters will go elsewhere for breakfast. Birds are scared off brassica crops by special scarers, scarecrows or more effectively by netting and string. Mice have eaten lots of my bulbs this year and when I plant new ones I will put a mesh over them before the soil is replaced as protection. Rats I have had to poison as they bred around my compost heap. I was asked about dog problems at our local crown green bowling club. Apart from the treatments above the only answer would be a 24 hour patrol! Dog vs Garden – Year II by Todd Dwyer CC BY-SA 2.0 ‘It looks like the dog is ahead on points. What ticks on a wall? Ticky paper! As a child I thought this was a joke and my humour hasn’t improved with the decades. I have used these sticky fly papers to control the small compost flies that breed on soil on my windowsill. Fly papers are also useful for greenhouses where white fyl populations need to be controlled. 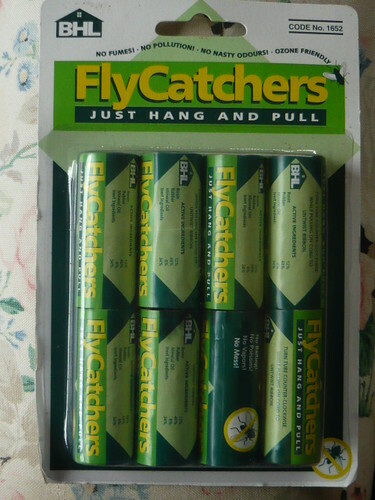 Fly Papers are easy to use some are non-insecticidal sticky fly catchers. With an attractant on the paper they are simple, inexpensive and effective. Amazon supply Fly Papers from around £3. Do computer experts have Pixels at the bottom of the garden? If they do they do not get caught on fly papers. 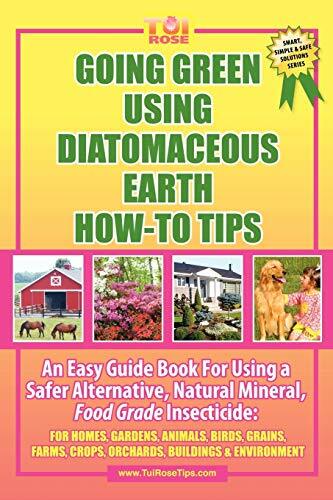 Diatomaceous Earth is a food grade insecticide that originates from ancient fossilized algae provided by Mother Nature. Safe as a natural insecticide for homes, gardens and pets. Soap like Savona is a fatty acid, non toxic insecticide that is a safer alternative to chemical pesticides. Green Pesticides for Insect Pest Management by S. Ignacimuthu (Editor) and S. Jayaraj (Editor) is not cheap at £56.05 but is aimed at a professional market. Are you plagued by neighborhood cats or random visitors sitting on your prized plants. If so there are varoius measures you can consider. One trick is to create some flickering random light reflections as a deterrent. CD’s on a string or some plastic bottles half filled with water in your borders. Cats see the light reflections, gets spooked, and hopefully slinks away. Grow ‘Coleus Canina’ the “pee-off plant” or the “scaredy cat” coleus. It gives off a smell that cats just can’t stand but humand find OK. Put branches of thorny plants under bird feeders or grow some Berberis. 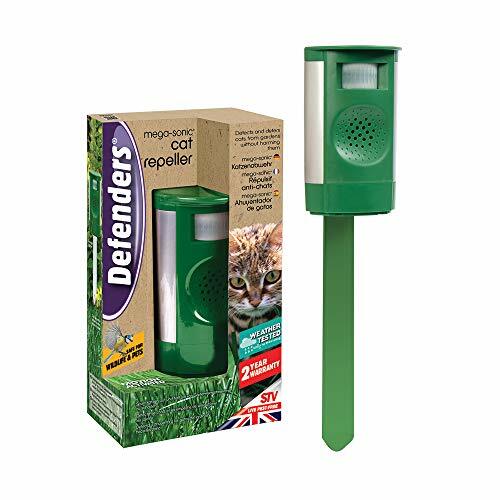 Buy an infra red detecting ‘Defenders Mega-Sonic cat repeller’ to protect your garden habitat and encourage wildlife and birds back into it. Try ‘Get Off My Garden Cat & Dog Repellent’ available as Crystals or spray. What other animal dares to intrude on a big cat’s territory? ‘Silent Roar’ fertilizer uses non-toxic pellets soaked in real essence of lion dung. 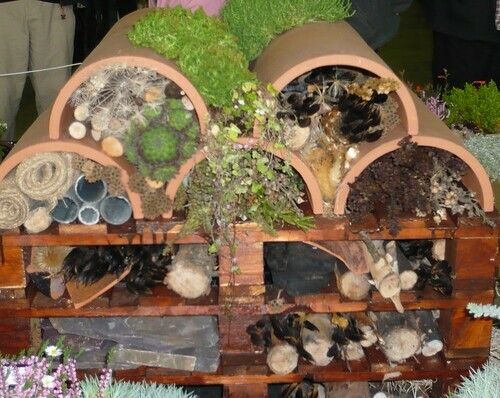 Gardens need insects and bugs so why not treat them to a snug insect house. You can build a multipurpose house from wood, stones and old pipes similar to the one above. Fill gaps with twigs, straw and rotting wood which will provide some food. The insects will make a home in the cracks and crevices that provide winter shelter. 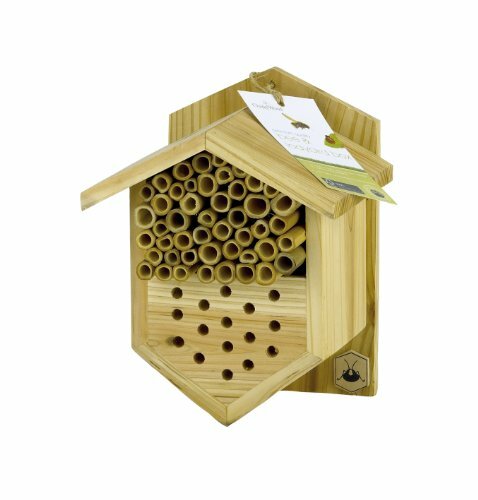 Bee nesting boxes will cater for bees and ladybirds. Place on a south facing wall for optimum sunlight to help bees and for ladybirds place the nester in a sheltered area near tree branches and vegetation such as nettles. Moles in the lawn are unfortunate, as they are difficult to remove without killing them. Their main diet is earthworms, but, removing these valuable garden creatures is hardly worth while. They are more likely in sandy soils, but, can appear anywhere – especially in more rural areas. There are some things that are said to help remove moles, but, they are not guaranteed to work permanently. The mole hills are unfortunately unsightly, however, at least moles don’t do any real damage to plants, they are more a nuisance value than anything. 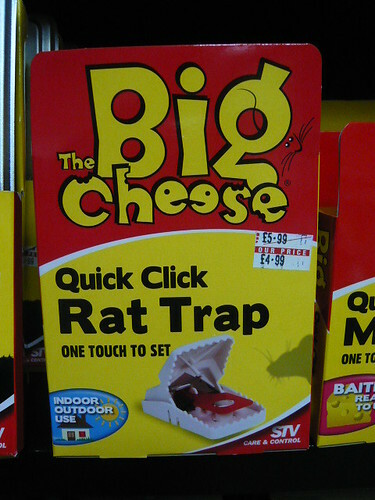 If you really want to get rid of them, you may be best of employing the services of a professional mole catcher / killer. However, if you live in a very rural environment, you may have your work cut out as they are likely to keep returning. This simple mole trap is put in a mole’s tunnel, it catches moles without killing them. Aphids can do a lot of damage to plants. Firstly they weaken it by drinking the sap. Secondly they can spread disease such as powdery mildew. Aphid action also often attracts ants, who enjoy the sticky residue left by aphids. Ants are not directly a problem, but, they can damage the base of plants and look unsightly. If you have some prize specimens, keep a close eye for first sign of infestation in April, May. At first sign you can try squeezing them with your fingers or blowing them off with water. If you are going for organic control, you will want to be encouraging natural predators such as hoverflies and ladybirds. This can be done by using plants which attract the hoverflies. For example stinging nettles and marigolds. If organic controls are insufficient, you may need to resort to a chemical spray which kills the aphids and can also provide a systemic action, entering into sap and preventing future infestations.